#ContangoETFs Sold to Open $NUGT Jan 2020 40 calls for 2.10. Took over a month since it last peaked, but patience can be a virtue with these levered suckers. I am long $TQQQ 66.67 LEAP calls for Jan 2020. I wanted to look at the effect of compounding on the TQQQ, which moves 3x the $QQQ on a daily basis. Levered ETF’s like this are naturally drawn toward zero, a topic I’ve covered before as #ContangoETFs. This is why some of us sell calls on $DUST and $NUGT and a few others like $BOIL. Even though they can go high pretty fast, they will always be drawn back toward zero. As you can see, over just 4 days of moving up and down, GDX is only down 2% and both ETF’s are down 18%. 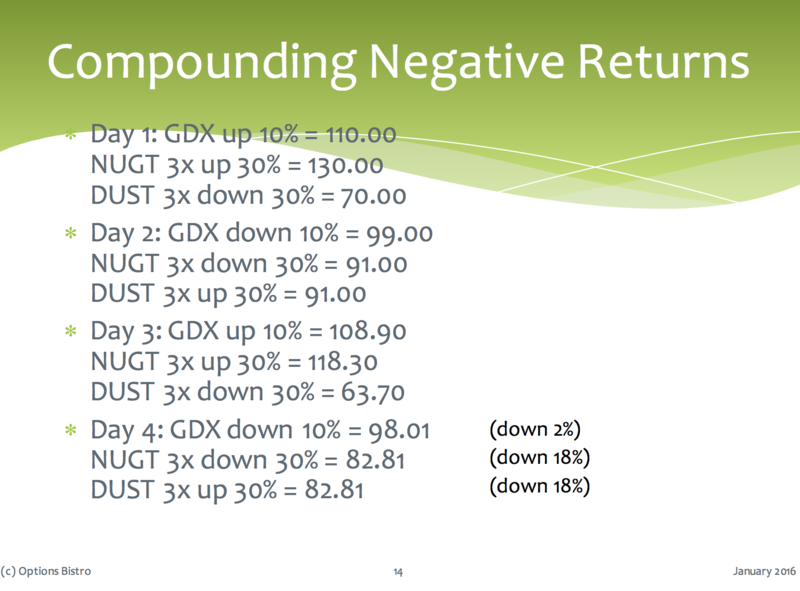 Note that even though NUGT is bullish and DUST is bearish, they moved down the exact same amount. So I was thinking of TQQQ over the last several months, since the market has gone up and down significantly. Unlike the gold miners, the indices like QQQ have been steadily rising for years, so can we can expect better behavior? I found that the close on June 6, 2018, was only 17 cents off from yesterday’s close on QQQ, so basically the same, and the perfect point from which to measure. First, I looked at the intraday high of the year, on Aug 30th. This is not surprising, as the move was straight up, and TQQQ performs x3 the QQQ. So, from June 6 until now, TQQQ has suffered from the 3x compounding, while QQQ ended flat. What do we conclude? If an underlying has a persistent bullish trend, as QQQ and all the major indices have had since 2009, the triple levered ETF’s will perform better. However, if we enter a period of consolidation, or a bear trend, they will perform more weakly than the underlying. #ContangoETFs $NUGT peeking above its recent highs. Sold June 30 calls for 1.35. #ContangoETFs Yesterday, Sold $NUGT Sept 35 calls for 2.06. First time back in NUGT in a long time, and currently my only ContangoETF position. #ContangoETFs Closing out the year by closing out final $BOIL positions. Was forced out of Jan 45 short calls by the spike higher… made some back with rolls, but still at a loss overall. I will reserve this symbol for large seasonal spikes in the future. Closed BOIL Mar 50 call for .90. Sold for 4.15. Closed BOIL June 66 call for .70. Sold for 7.20. #ContangoETFs Closed the last of my $BOIL Jan 45 calls for 3.30. I’m underwater despite a few rolls, but this is closest to the money that I had. I want to be ready should we get another winter push higher.